Culture Minister Miri Regev (Likud) participated in the third children's film festival in Samaria, and promised to rectify unequal cinema budget distribution and stop Judea and Samaria's exclusion from these budgets. "We'll bring great news to the cinema," Regev said. "There's now a committee that's just finished its work, a committee whose results will cause great agitation in Tel Aviv's cultural nerve center. "But there's nothing they can do. They'll have to stand in front of the mirror and understand that we'll make a change in cinema budget allocation in the State of Israel," added the Culture Minister. 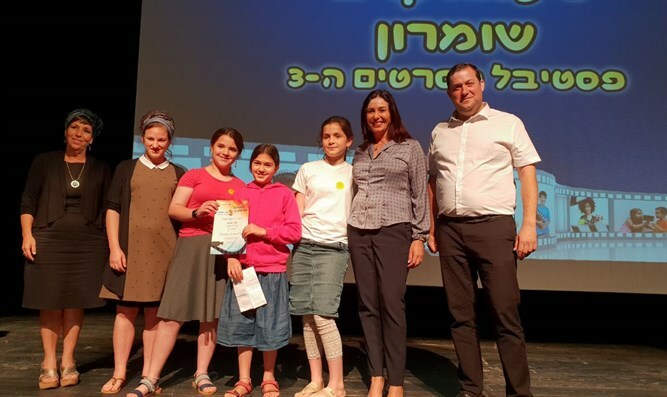 "It's impossible to exaggerate the importance of the work, be it in the field of cinema, theater, or other areas," Shomron Mayor Yossi Dagan said at the ceremony. "There's no better way to convey messages, discuss issues that bother us and reflect reality. We'll continue to work to strengthen creativity throughout Samaria, and to bring out a new and unique voice in the field of culture. "The equitable distribution of cinema budgets is the right thing. After 50 years of discrimination in the field, we're pleased that the Culture Minister is handling the issue and promoting it," Dagan stressed.